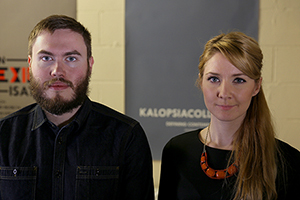 Kalopsia are a textiles micro-manufacturing service. Production including seamstressing, pattern cutting, garment construction and finishing. The custom micro manufacturing service provides short run, bespoke production. No previous knowledge is required and the team can help with prototyping, sampling, short run (1-500 units) as well as pattern construction. As long as you have an idea about timescale, budget and volume Kalopsia are happy to work with you. Kalopsia was formed in 2012 by a group of international creators who felt there was a distinct lack of support and space within the arts community for contemporary textiles. The company today operates as a social enterprise for textiles production, where the team manufacture textiles products for British and International clients in a sustainable manner from start to finish. This is to help address the social and environmental issues faced by textiles businesses and designers. Kalopsia strives to minimise the environmental impact of our business and manufacturing operations.